Only three weekend closures remain for this summer’s US 2 paving project, but Snohomish County travelers must brace for the biggest traffic delays yet. During these closures, crews will repave the west end of the Hewitt Avenue trestle, between Homeacres Road and the I-5 interchange. Because of this, the 20th Street Southeast detour used during previous closures will not be available. 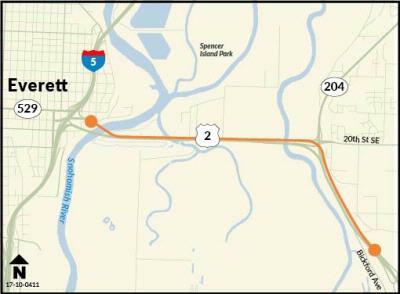 Instead, travelers must detour onto SR 9 with options to go northbound on a 10-mile route to SR 528 in Marysville or southbound on a 12-mile route to SR 96 in Mill Creek. Travelers can get real-time traffic conditions before heading out the door with the WSDOT traffic app and by checking the WSDOT Traffic Twitter feed.